At the farm we do western riding, a riding style that is based on peace and simplicity and by the non-western rider defined as safe and comfortable. It is not necessary to have experience to ride with us! Everyone is welcome! Winter 2018/2019...or are you coming summer 2019? Do you want to book one of our trail rides together with your partner, family, friends or colleagues? 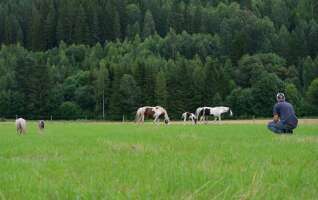 If you are looking to fill up a whole day with activities or even several days back to basics out in the forests by horse? Rent a holiday home for a while and enjoy the lovely nature around the Farm.. Our Little Farm offers various arrangements that we can adapt to your personal wishes. In addition to our packages, you can choose from a wide range of activities for during and after horse riding. 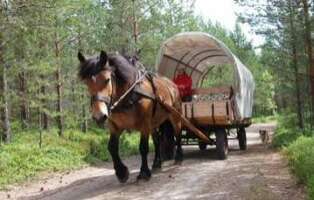 From Wildsafari's, Chuckwagon tours, Sledge tours in the winter, barebackriding to groundwork with the horses. 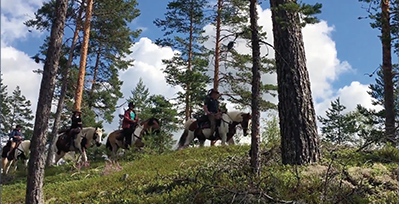 Take a look at our offered activities..
Ride your horse, set up your tipi for the night in the forests and sleep under the stars... Cross over mountains, through forests, sand drifts and rivers. An arrangement to never forget. ...a trip by nature with pause in the forest with a drink and some food.